With our ‘PIG’ we’ve combined Old World aesthetics and sensibilities with the very latest in materials and design! Details like our solid .27” titanium back-spacer, which we mill in-house, combines the inherent strength of the traditional back-spacer with the openness of standoffs. It goes one better then either by giving you the stength of a solid back, yet leaving the back completely open to make cleaning simply a matter of running any water or air source through the knife. 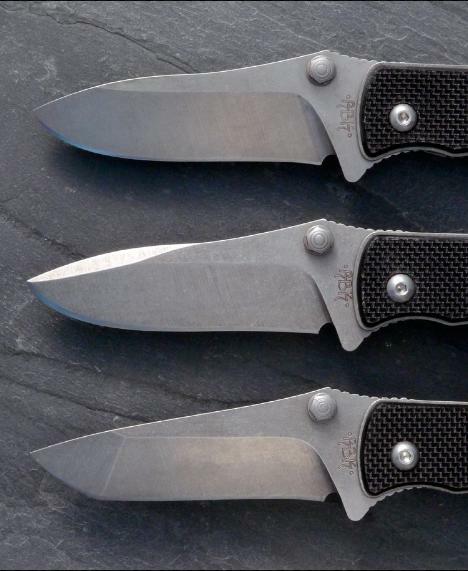 Our ¼” S30V blades, used both on our modified spear point, and our tanto, combines what many believe is the strongest knife steel on the market today, with grinds that give you an unusually sharp edge in a design built for hard use. We have jimped our blades both front and back, as well as the back-spacer on both sides, so that you have positive grip surfaces in any type of hold, and in any type of conditions. Wet hands, muddy hands, gloved hands, it won’t matter. Although our blades come with a rough tumbled finish, the area around the pivot is mirror polished for an incredibly smooth action! We use bronze washers with white lithium grease, because it is a tried and true combination, and we’ve found, less susceptible to dirt than bearings. Both the stop pin and the lanyard pin are all hardened 440 steel and are identical, which basically means that you have a spare stop pin! Our .080” titanium liners are full thickness from top to bottom making them thicker and stronger than many frame-locks, which although they do have thicker sections, are milled or relieved at some point to a thinner dimension for ease of flexibility at the cost of strength. We've improved on our original PIG, pictured below, and are introducing the Generation 2. The two most obvious changes are the clip and the pivot. We’ve moved to a low carry clip held by two 4-40 stainless screws that screw into the solid titanium spacer rather then the liner. The pivot has been replaced with a custom milled pivot, also hardened stainless steel, but threaded with a unique 64 tpi fine thread which allows for precise adjustment of the blade tension. 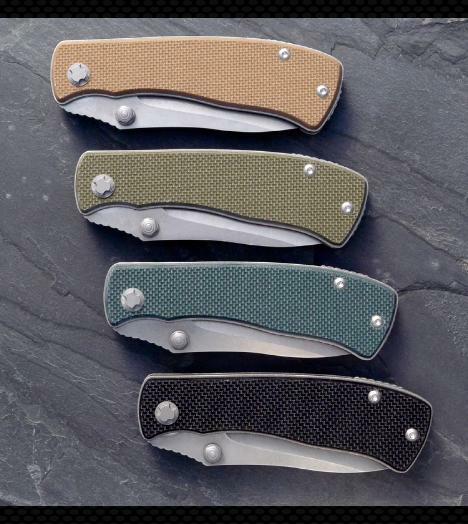 In addition there are aesthetic improvements to the fit and finish of the knife, for example recessing the clip into the handle and making all the screws torx. The gen2 is the same knife you’ve enjoyed, only better! Our ‘PIG’ is built to be a hard use knife, a trusted tool. She’s got the rough and dependable lines of a good working dog… Like the dog she was named after… Rest in peace my beautiful Pig. You’re a good girl, and your Daddy misses you! The color will not be exactly what you see on the screen, as monitors vary. 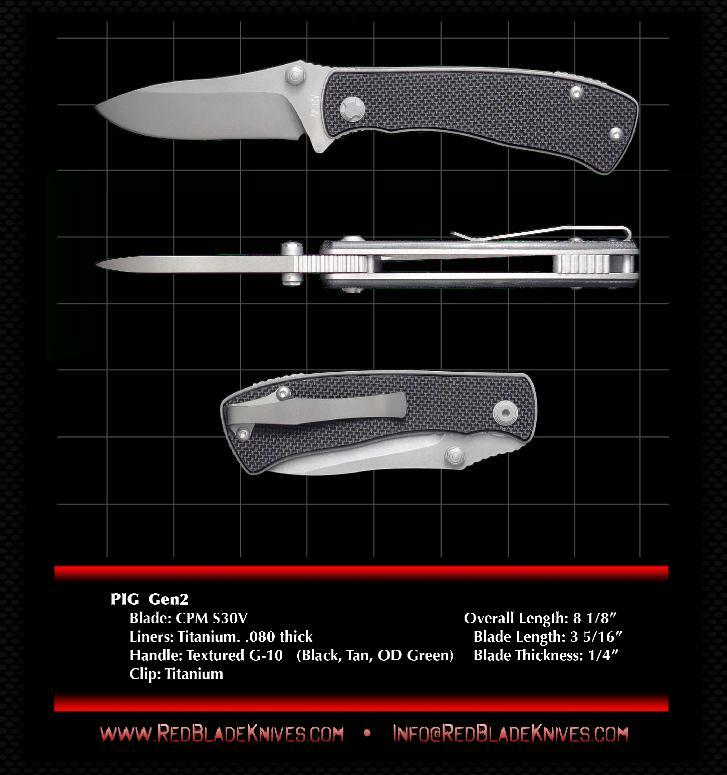 Contact info at "info at RedBladeKnives.com" Red Blade Knives, a maker of fine folding knives. Made in the USA. Tactical Folders, Knives, CPM 154, CPM S30V, Titanium Liners, Textured G10 grips, military utility knife.